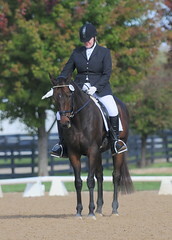 Canter two point. We’re both working. After a week out of town for work, during which I was totally overbooked and thus pretty much sedentary, I was eager to get back in the saddle and continue the work we started last week. We didn’t do anything earth shattering. 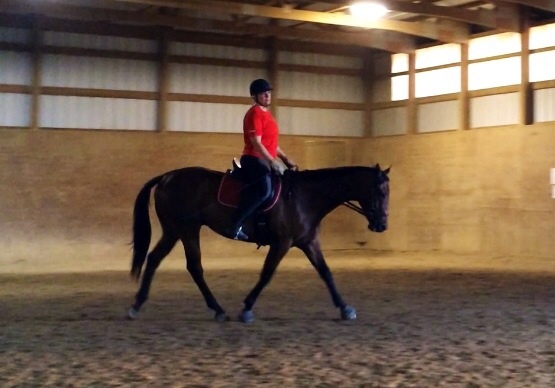 I am still struggling to maintain the new position – the progression according to George Morris is “Hard, Easy, Habit, Beautiful” and needless to say, I’m stuck in “Hard.” So I’m working in two point for some of each ride to help develop a good base of support and stronger lower leg. We’re also trying to put the canter back together, an I’m finding it hard to sit the canter and really plug into the saddle, probably due to the oft-mentioned tightness in my hips. So I’m hopping up into two point to help us both out. Yes! Activating the inside hind, and even getting him to lift his front end a bit. 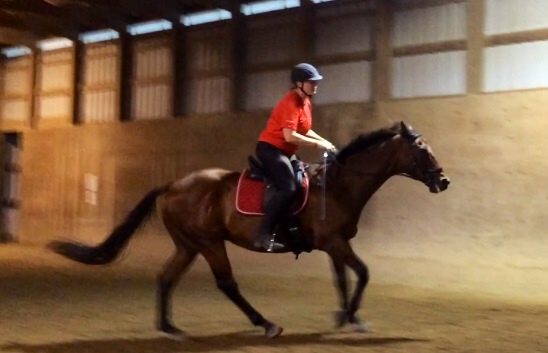 Keeping Derby pushing from behind and really using his inside hind is a real priority for me right now. So I worked on shoulder fore, a wee bit of shoulder in, and some leg-yield here and there. We’re back into lessons full bore starting tomorrow night, so hopefully, I’ll soon have more progress to report!